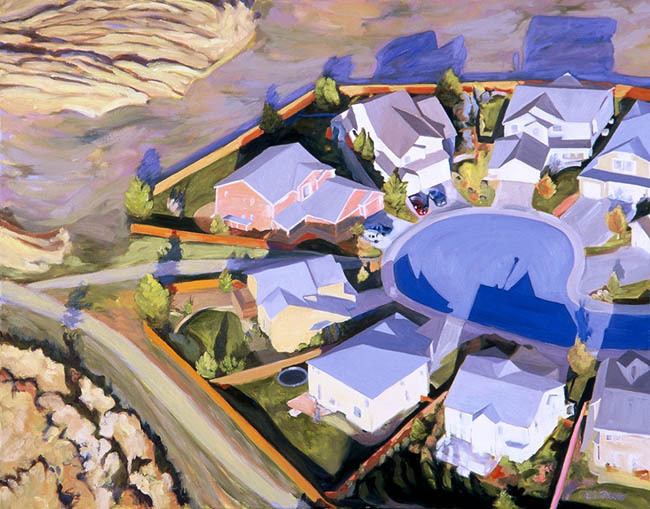 Grounded by the earth, artist Buff Elting portrays a world of interconnectivity. Seeking a viewpoint off or above the beaten path, she discloses relationships of natural and manmade activity as spectacles of brilliant color and robust pattern. Continually reshaped over geologic time and within human history, nearly-flat terrains, consisting of tracts of land crossed by waterways and roads and dotted with trees, ponds, houses and other structures, are the tell-tale topographies of outskirts. Elting favors the outer reaches of settlement and just beyond in which the marks of habitation commingle with the environment. Coupled and contrasting forms created by our ecosystem provide both dynamic interplay and forceful juxtaposition, which has all the beauty of a relentless pas de deux. Ordered and irregular features cast transient yet sonorous shadows, making even more varied, uneven shapes. Illusory but of equal weight to the physical, these effects of sunshine are stretched and interposed within the lay of the land, emerging as an enlivening compositional overlay. Substantiating and disassembling, the darkening specters suggest a dimension other than the sight that is beheld. Once a photographer for a dance company, Elting is drawn to imagery that involves transitional states, such as figures in motion captured as blurs. “Something you can’t see with the naked eye,” she explains. Not mere mappings or transcriptions of aerial views, her paintings have an emotional nigh on mystical content in which the visual is the means to perception beyond appearances. While not hallucinatory, the color in Elting’s work is heightened, with bold combinations of both hue and tone conveying even more intensity and passion. Her palette is derived from the Western landscape, especially the scintillating hues perceptible at certain times of day. 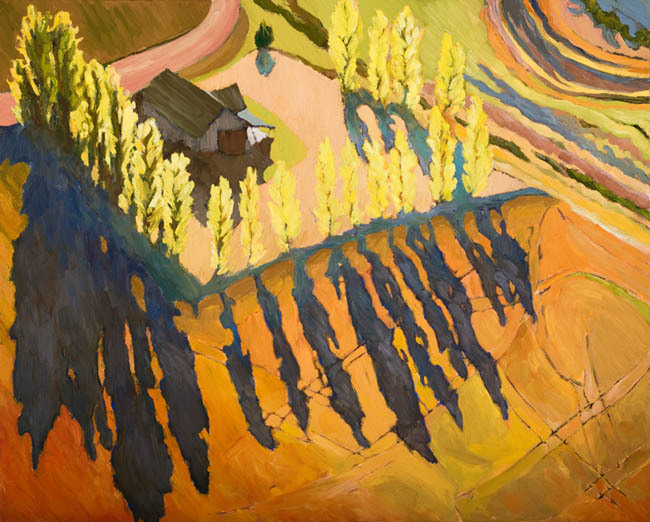 Yet shapes and contours seem to be steeped in color, as Elting’s paints what she calls “an immersion in a bright universe.” Her greens will often have a strong yellow component, and yellow fields and ocher expanses embody nectar-like butterscotch, apricot, and caramel. 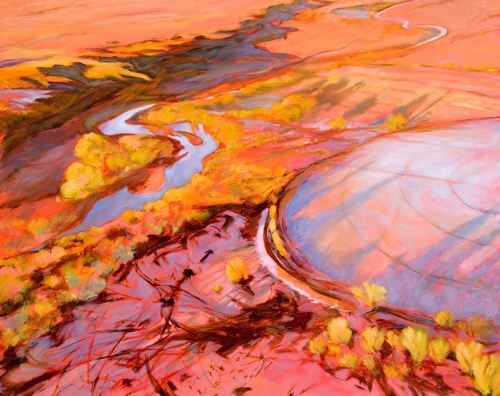 Tending toward warm colors, she uses blues and purples as punctuating counterbalance, but blue also plays a defining role as water of rivers, streams, ponds, irrigation ditches, and reservoirs. Where there is water there is life, and, consequently, many areas of blue serve as an organic system of aggregation and dispersal. Perhaps attributable to her training as a printmaker, Elting achieves her vivid colors by building up layers of thin pigment. 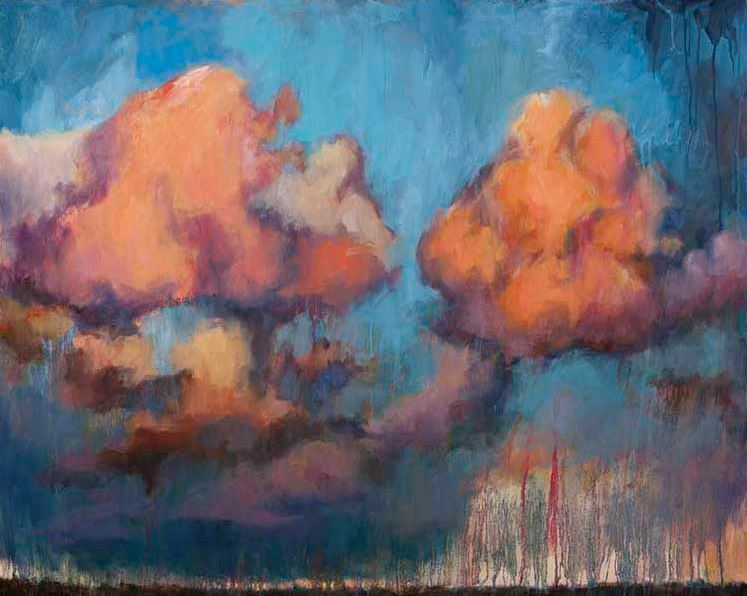 In some paintings, such as her skyscapes, she lets drips of paint remain visible, which reveals her hand in the application — the coming into being — as well as references the liquid basis of the swelling clouds. Certain conditions give rise to the dramatic formations. Likewise, Elting develops her artwork through intuitive understanding of the properties of her materials and through responding accordingly to the subtle changes in composition, texture, and color as they emerge. Not all landscape painters embrace the outdoors, and not all outdoor enthusiasts pay attention to the beauty to be found in nature. Making outdoor physical activity an integral part of her life, Elting pursues a range of challenges such as hiking, trail running, cycling, rock climbing, kayaking, rafting, skiing, scuba diving — all but the last readily accessible in open spaces and wilderness near her creekside home in Boulder, Colorado. Invigorated by the sweep and enthralled by the details of nature, she has knowledge of color and tonal relationships that come as much from moss and lichen on a cliff face as from a page from Albers’ theory. Her atypical landscapes stem from an awareness of the complexities and multiplicity of the natural world as experienced, which is at odds from any predetermined template. In her studio, pigments and other media are worked with the exuberant lushness and bodily sensitivity gained from her ongoing, deepening connection, in a way acting out what she has imbibed. Other than the edges, there are no absolutely straight lines in her artwork, so that even wooden planks show evidence of the varying weight and movement of her touch. One of Elting’s favorite authors is Ellen Meloy, who in The Anthropology of Turquoise gives a personal account the nearly forgotten maze built by the Mojave Indians in the Aha Makav Valley. Like other prehistoric geoglyphs, the image can only be viewed from the air, such that it is thought to be for hovering spirits. In countering the fixed vantage of traditional landscape, Elting returns to an ancient wisdom founded in a reciprocal relationship between people and nature made manifest over centuries in objects, pictures, and monuments. Loosening the moorings of ordinary consciousness, through wonder she elicits the supernatural reality of a river canyon, a cumulus cloud, a tilled field in the prairie, a dock for recreational watercraft, or a suburban cul-de-sac — letting her pantheist sensibility reside in surprising place.